Ricoh WG-M1 is an action camera packed with interesting features and it has an affordable price that’s perfect for folks interesting in extreme sports or one-of-a-kind trips around the world. Ricoh WG-M1 has a 14 MP sensor, f/2.8 ultra-wide angle 160° lens and it is completely waterproof. In other words, thanks to the underwater lens protector, it will allow you to shoot high quality videos at a depth of 10 meters under the sea level for 1 hour. You can also take this camera to your winter sports activities, because it is designed to resists to low temperatures of 14° F (minus 10° C). The control LCD is not huge (only 1.5-inch), but it’s just enough to do the job. Let’s not forget, this is an action camera, and this means that you will be focusing on the action, not on the LCD screen. 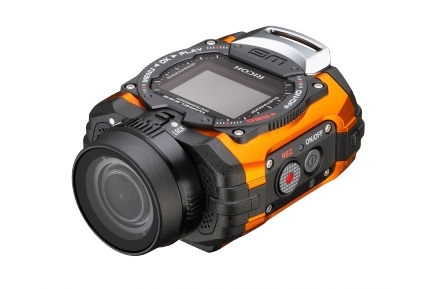 The Ricoh WG-M1 action camera will record Full HD widescreen videos with a resolution of 1920×1080 (Full HD), compressing the videos in the h.264 standard. The camera costs only $299 and I truly believe it’s a great alternative to the famous Go Pro.